See what I grew from a handful of bean seeds – four pounds of shelled Field Beans from one square metre of raised bed (excuse the mixed metrification). 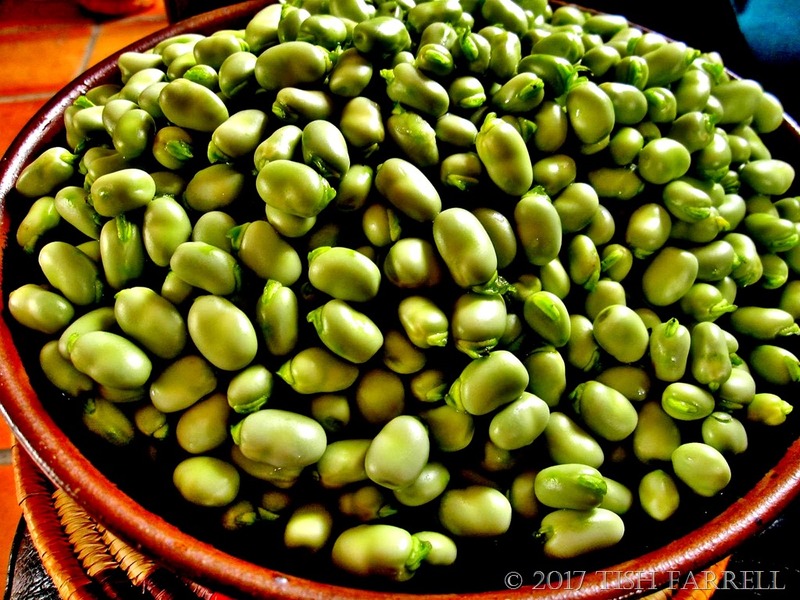 For those of you who do not care for Broad Beans, these are their much smaller, juicier cousins, although they are all known as Vicia faba, faba or fava beans. They are one of the oldest Old World vegetables, their remains found on ancient Neolithic settlements in the Near East, where their cultivation probably originated some 8,000 years ago. From there they spread across Western Europe and North Africa. Today, of course, they are perhaps best known as a staple of Egyptian cooking, the dried and rehydrated beans forming the basis of falafel. I use them to make soup, or refried beans or a bean version of guacamole which is surprisingly convincing. Otherwise we just eat them steamed with melted butter and chopped parsley, or add them to a green salad with a vinaigrette dressing . 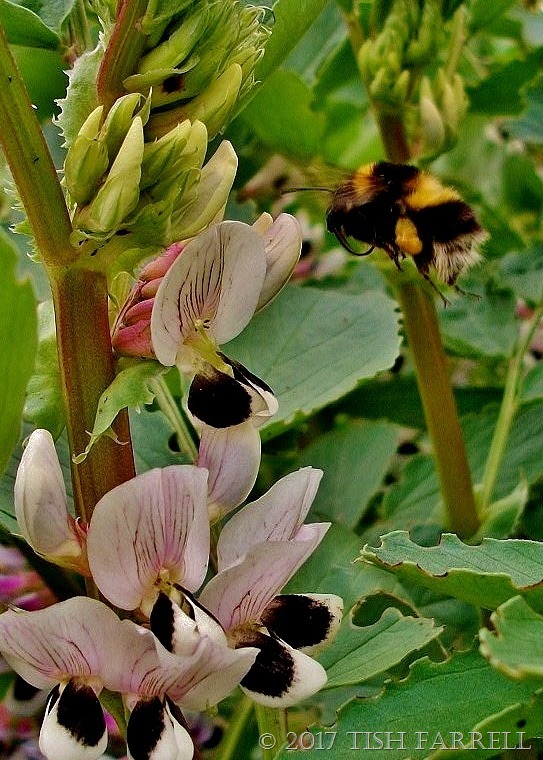 In the UK this small-beaned cultivar is usually grown as a green manure, or as animal fodder. As green manure it is good for breaking up heavy, clay soils. The seed is sown in autumn (September to November). The plants will germinate quite quickly, and are left to over-winter. In spring, once they have shot up to about half a metre or 2 feet, and before it flowers, you are supposed to dig them in. By then the roots will be quite deep, and they also have the added benefit of fixing nitrogen. A good follow-on crop would be cabbages or broccoli, or any brassicas. I prefer to grow mine to eat. Not only that, they have wonderful flowers that waft their scent over the allotment in late spring and get the bees very excited. The plants require no attention. Slugs don’t care for them. I grow them in blocks which tends to make them self-supporting, so I don’t add string supports as you need to for broad beans. I don’t feed them or even water them, not even in our increasingly arid springs. I do, however, pick off all their growing tips at the end of May to discourage black fly invasions. Growing Field Beans to eat seems to me like a win-win-win situation. They feed me and He Who Is Presently Building A Shed; they feed the bees; they feed the soil. They also freeze well, and there will be enough to dry to sow in autumn for next year’s crop. And then there’s all the top growth to add to the compost heaps. You may perhaps have noticed the bean weevil damage on the leaves. It is one of many endemic pests at the allotment, but their nibbling doesn’t seem to affect the crop. So now please conjure the sweet, subtle fragrance of bean flowers. There is no scent quite like it. Aaaaah…magic beans!